Urban Art is everywhere. Unsolicited, it leaves its traces and signs in urban space. It conquers public space with stickers, posters, extensive murals, and stencil graffiti. It’s galleries are the world’s streets. What began as graffiti in the large cities on America’s east coast forty years ago has since experienced a decisive development. Even if the majority of actions continue to be produced anonymously and illegally, it is no longer exclusively a phenomenon associated with youth culture. Many of the protagonists have emancipated themselves from the pictorial language of graffiti writing and experimented with new forms of expression. With their subtle and humorous, occasionally offensive interventions in the urban landscape they attempt to force open familiar visual habits. As a rule, they are not concerned with damaging the urban infrastructure but with participating in a dialogue with the public. There is a variety of Urban Art. Temporary actions, unusual objects and sculptures, lettering, and characters are woven into the visual flow of the city as stumbling blocks. The possibility that many of the passers-by take no notice of these interventions is consciously taken into account. Thus they comprise a subversive counterweight to the constant presence of advertising, whose blinking images and seductive buying options dominate everyday life. It is not only in this respect that Urban Art is the expression of a critical examination of the social, cultural, and economic dimensions of the city, which in the age of globalization is rapidly and sustainably changing. Urban Art has recently experienced a downright hype. Numerous galleries and museums around the world have organized exhibitions, and works by the most well-known representatives of the genre have gained premium prices at auctions. What some accuse of being commercialization, the loss of authenticity, and the betrayal of original interests is viewed by many artists as a new chance. By transferring their themes and methods in the protected space of the museum, they develop very new and surprising approaches. But what kind of art is this that leaves its ancestral terrain? Do the works not require the city as a resonating space, as an immediate opponent? And is one of the essential features of Urban Art not its impermanence, its spontaneity? The Weserburg will be devoting itself to these questions in a large-scale exhibition centered around works from the Reinking Collection. The Hamburg-based collector Rik Reinking is a man of conviction. He has for many years now been accompanying numerous artists in the scene with great passion and intensity. His collection now includes representative works by some of the most influential protagonists. These include such well-known names as Banksy (UK), DAIM (Germany), Brad Downey (USA), Os Gemeos (Brazil), Shepard Fairey (USA), and Zevs (France). The exhibition will be supplemented by several artistic stances and new works, which have in part been produced specifically for Bremen. In addition, artistic interventions are planned in the Hanseatic city’s public space. Thus the exhibition will not only afford insight into a still young, unusual collection, it is at the same time a venue for the most recent developments of non-conformist art form that is in a constant state of flux. The exhibition will be supplemented by an attractive supporting program with workshops, walks through town, film evenings, and discussions and thus stimulate a lively as well as critical examination of the phenomenon of Urban Art. In addition, a comprehensive catalogue will be published including numerous illustrations and texts that are worth reading. 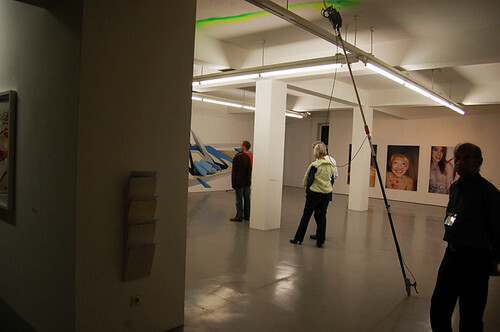 The exhibition concept was developed by Ingo Clauß, curator at the Weserburg; Adrian Nabi, who as the initiator and curator of Berlin’s Backjumps exhibitions is one of the most well-known aficionados of the scene; and the collector Rik Reinking, who has been closely connected with the museum for many years. Responding to an invitation by the 32nd German Protestant Kirchentag (May 20–24, 2009), parallel to the exhibition, Kunstraum Kreuzberg / Bethanien is realizing the project "Sign Seeing" (PDF Flyer) in Bremen. Besides highly interesting events related to Urban Art, the Copenhagen-based artist Victor Ash will be designing all four sides of an overhead hopper and thus set an example for a lively examination of street art. A collaboration between Reinking Projects and Kunstraum Kreuzberg / Bethanien. In cooperation with the 32nd German Protestant Kirchentag, May 20–24, 2009, in Bremen. Special thanks go out to the Friends of the Weserburg. Hide and Seek – Searching Through Disguise. Manchmal ist es schwierig, Menschen offen und unverstellt gegenüberzutreten. Welchen Eindruck hinterlässt man bei anderen in Unterhaltungen, beim Tanzen oder mit der Wahl unseres Outfits? Wie lässt sich mit den täglichen Nachrichten über Hunger, Krieg und andere Konflikte fertig werden, die aus aller Welt über die Medien zu uns vordringen? Die Angst vor dem Auffallen und Auffälligsein ist das Thema des Workshops von Dave the Chimp. Die Teilnehmer werden sich zusammen mit dem Künstler eigene Wunsch-Identitäten ausdenken, gestalten und diese mit den stilistischen Mitteln des Cartoons und des Characters persiflieren (via). Falling Writers And Astronauts – Victor Ash. Dieser Workshop findet an einem ehemaligen Bunker, den Victor Ash eigens für den Kirchentag in Bremen gestaltet, statt. Gemeinsam mit dem Künstler wird es eine Auseinandersetzung zu seiner Arbeit und den von ihm verwendeten Techniken geben (via). WIR SIND EINER VON EUCH – über das Platzieren von Botschaften im öffentlichen Raum. Der öffentliche Raum ist voller Botschaften, Hinweise und Erklärungen – sie sind bunt, riesig und bestenfalls fühlen wir uns gar nicht angesprochen. In Broncos Workshop wird überlegt, was für Botschaften eigentlich fehlen und wie diese mit eher »soften« Methoden wie Kreide, Notizzetteln oder Aufklebern umgesetzt werden können (via). 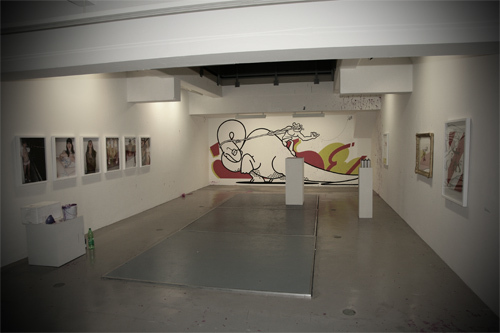 Urban Art erobert mit Stickern, großflächigen Wandgemälden und Schablonengraffiti den öffentlichen Raum und hinterlässt Spuren und Zeichen in den Städten. Mit subtilen, humorvollen oder auch offensiven Eingriffen in das Stadtbild brechen die Künstler eingeübte Sehgewohnheiten auf und treten mit Aktionen, ungewöhnlichen Objekten, Skulpturen oder Schriftzügen in einen spannungsreichen Dialog mit der Öffentlichkeit. Im Zentrum dieser Publikation stehen Werke aus der Sammlung Reinking, die mit repräsentativen Arbeiten von Künstlern wie Brad Downey, Banksy, Mark Jenkins, Zevs und anderen die einflussreichsten Akteure der Strömung umfasst. Der Band untersucht Ursachen für die in den letzten Jahren ständig wachsende Popularität der Urban Art und beleuchtet, welche Auswirkungen die Überführung der Kunstwerke in ein museales Umfeld auf die Arbeiten und deren Rezeption hat.